The timeless tale of Little Orphan Annie is back, giving a whole new generation the chance to experience this classic musical about never giving up hope. 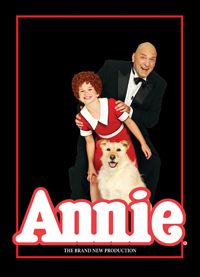 Boasting one of Broadway’s most memorable scores, including “It’s the Hard-Knock Life,” “Easy Street,” “N.Y.C.” and the ever-optimistic “Tomorrow,” ANNIE is a delightful theatrical experience for the entire family. Don’t miss this all-new production at the legendary Kodak Theatre that Variety calls “a winner!” Visit www.kodaktheatre.com for more information. 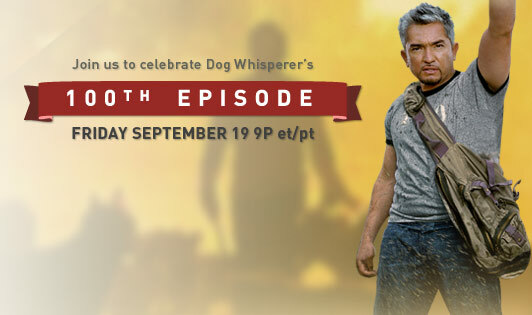 Wilshire and Ryan make a special guest appearance on The Dog Whisperer’s 100th episode! Join them as they help Cesar celebrate! The Firefighters Memorial was designed in memory of those members of the Los Angeles Fire Department who answered their last alarm. Wilshire and Friends joined the community in this dedication to celebrate the lives of our fallen Firefighters. You can visit the memorial and museum as they are open to the public on Saturdays from 10 AM to 4 PM. Located at 1355 N. Caheunga Blvd., Hollywood, CA 90028 - for more information call 323-464-2727. 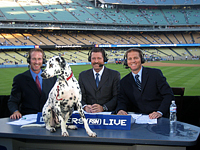 Watch for a special appearance by Wilshire & Ryan on Fox's Wednesday's Child feature. Wilshire stars as himself in a new film called Quarantine. The film will be released in October 2008. Jennifer Carpenter, and Jay Hernadez are shown here with Wilshire. Director John Erik Dowdle and Writer Drew Dowdle. Wilshire will be at this year's "Hope for Firefighters" on Thursday June 5, 2008 from 11:30am-2:30pm on Hope Street between 3rd & Hope Place in Downtown L.A.
Wilshire joined in the celebration at the grand opening ceremony of the new LAFD air operations, air support, and helicopter maintain facility at Van Nuys airport on May 31. This new facility gives the LAFD first class support for their fire and rescue equipment. 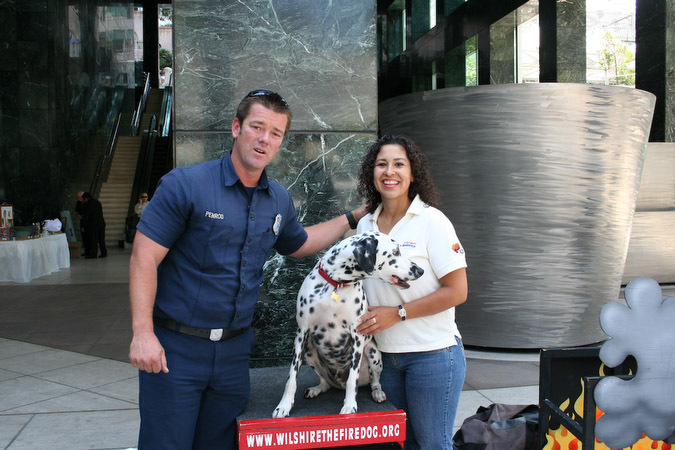 Wilshire and Ryan appeared in downtown Los Angeles at the CitiGroup Plaza to demonstrate the home safety plan. 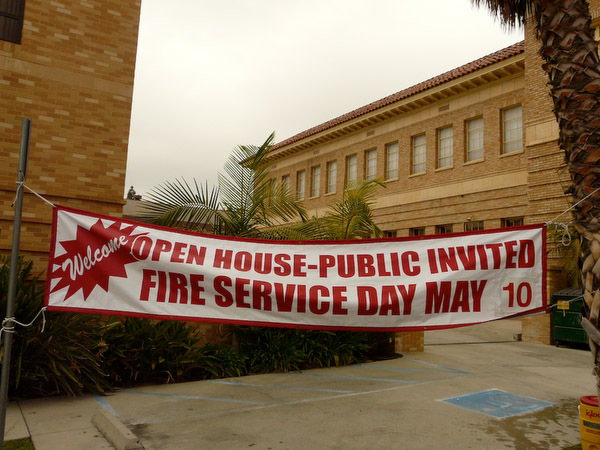 The second Saturday of May is Fire Service Recognition Day in Los Angeles. 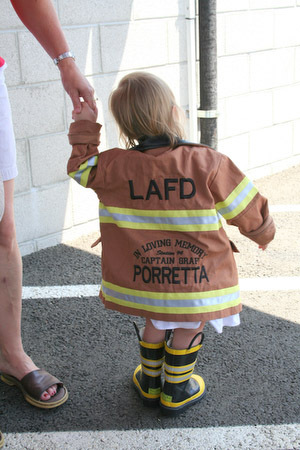 An Open House at every neighborhood fire station welcomes visitors of all ages. Wilshire and Ryan made an appearance at Mayor Villaraigosa’s City of Los Angele’s 2008 Asian and Pacific Islander American Heritage Month Poster Competition and Program. 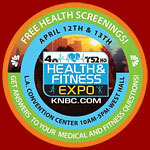 10:00 AM -5:00 PM both days! 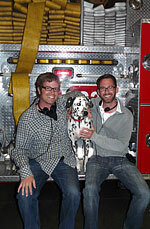 Wilshire and Ryan attended the 100th episode taping of renowned DOG WHISPERER, Caser Millan. Watch for it this fall on National Geographic’s The Dog Whisperer. 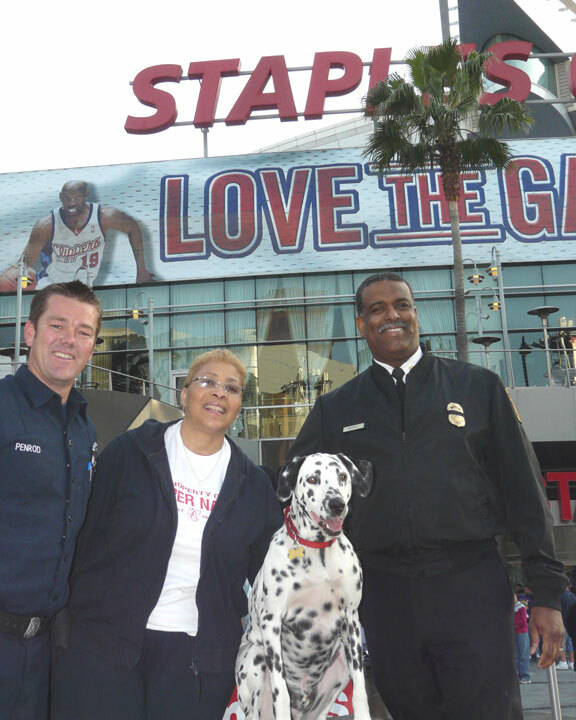 LAFD Chief Barry and his wife, Roberta joined Wilshire and Ryan in welcoming Clipper fans to the Clipper/Mavericks game on March 31, 2008. During half time, firefighters service to their community was honored. Wilshire and Ryan joined the LAFD and LAPD in this year's St. Baldricks event held at LAFD station 89’s! This event raises money to help childhood cancer. Wilshire and Ryan appear on Telemundo with the beautiful Erika Pino. 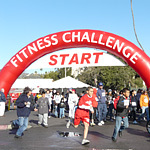 Children, parents, family and friends are all invited to join “Wilshire” the Fire Dog for the KIDS FITNESS CHALLENGE at the world famous Pasadena Rose Bowl. 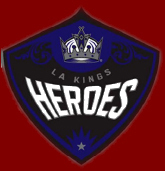 Watch for Wilshire & Ryan as they appear in an episode this season. 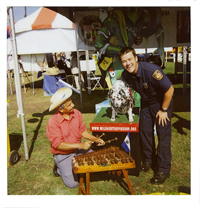 The Los Angeles Fireman’s Credit Union held it’s annual chili cook off and invited Ryan and Wilshire to perform their safety routine for the kids there. 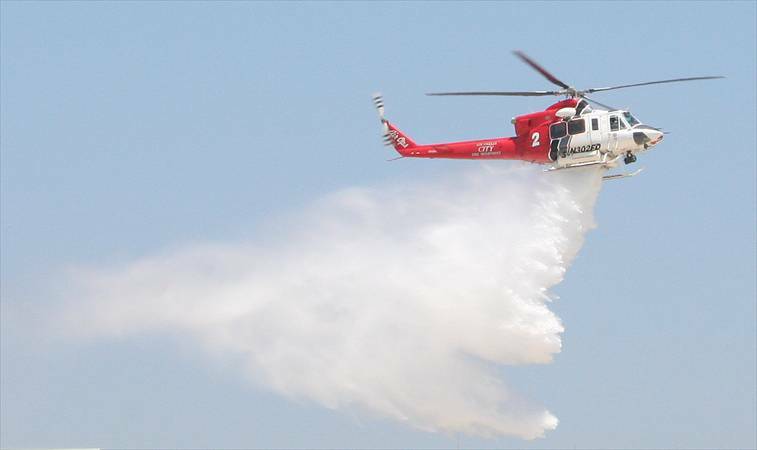 Hatzolah of Los Angeles held their annual barbecue to raise money for their all volunteer organization whose purpose is to respond to and provide a life saving bridge during the first critical moments of emergency situations in the communities they serve. 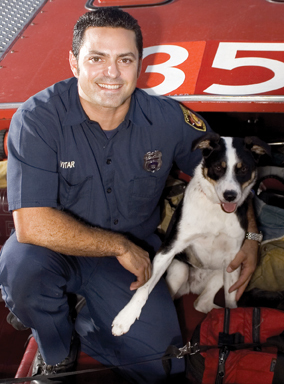 Wilshire and his fire safety demonstration were a main attraction at the annual Halloween Party for pets and their owners on Sunday at the White Point Nature Preserve in San Pedro. 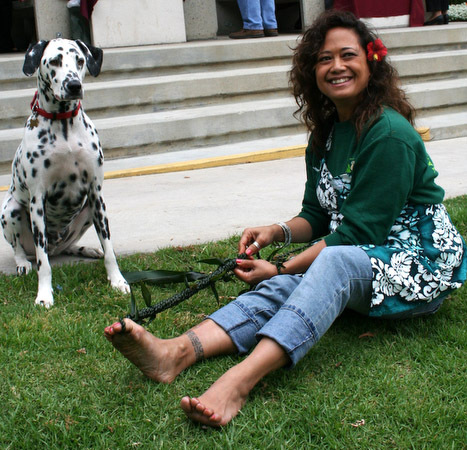 Hosted by the Palos Verdes Peninsula Land Conservancy. 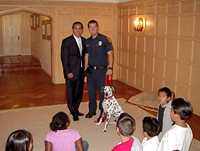 Wilshire and Firefighter Ryan demonstrated fire safety tips for the children of the Los Angeles Unified School Districts After school program at a special Halloween party held at the Getty House, current home of Mayor Villaraigosa. 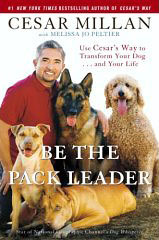 Wilshire is featured in a new book, Be the Pack Leader: Use Cesar's Way to Transform Your Dog . . . and Your Life by Cesar Millan. Larchmont Blvd. 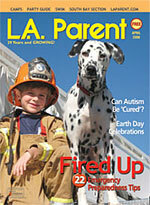 will be transformed into fairgrounds for the 31st annual Larchmont Family Fair on Sun., Oct. 28. 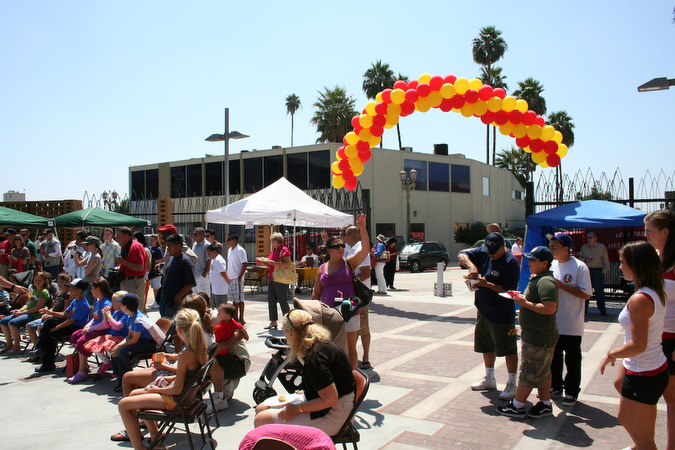 Sponsored by the Larchmont Boulevard Association, the fair will provide a community-based event for all ages. It also provides a chance for non-profits to raise funds for their individual organizations, said Earle Vaughan, Larchmont Family Fair chairman. More than 6,000 people are expected to attend this year’s event, which will feature food booths with international and American cuisine. 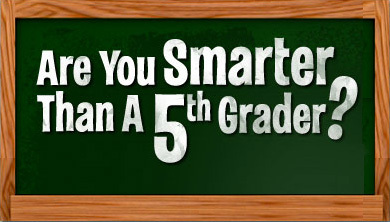 Also featured will be a petting zoo, pony rides, moon bounce and other children’s activities. 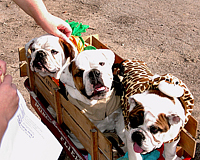 Have pet will travel..."DOGTOWN USA" is the hot new Internet series about hitting the road with your four legged friends! Popular TV host Patrick Stinson and his playful pup Pinta go across America to explore one of the fastest growing trends in the travel industry...pet friendly places! From fancy hotels, retail stores and restaurants to beaches, parks and hiking tours, "DOGTOWN USA" explores it all. JuntaHispana<?/x-tad-bigger><?/fontfamily><?fontfamily><?param Verdana><?x-tad-smaller>®<?/x-tad-smaller><?/fontfamily><?fontfamily><?param Verdana><?x-tad-bigger> is a Hispanic Heritage Month celebration of the cultures, traditions, heritage, food, dance, music, art, customs and people of 20 Spanish speaking countries. Wilshire and Firefighter Ryan along with their fellow firefighters attended Hero’s night at Dodger Stadium to honor fallen firefighter’s everywhere.